Inventor James Watt first coined the term horsepower in 1780. Accounts vary as to how he came up with it, but the generally accepted version involves trying to develop a method of calculating the amount of work performed by a draft horse operating a pump to remove water from a coal mine. Watt had modified a steam engine to improve its performance and he sought a way to quantify its power by relating it to that of a draft horse. Since horses were the primary power source of that period, the term horsepower was applied to his work. Through observation and measurement, Watt determined the horse’s ability to generate a torque (twisting force) about a capstan that operated the mine pump. He calculated that the horse could move 33,000 pounds 1 foot in 1 minute. He called that 1 horsepower. An engine dyno is often called a brake because it brakes or resists engine output for the purpose of measurement. 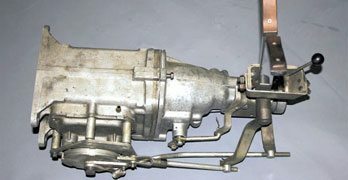 A very early dyno called a prony brake may have also lent its name to the dyno. It used a form of brake shoe to resist engine power. Most modern dynos use a water brake absorber or an eddy current absorber, which uses electrical current to brake the engine. An engine’s VE curve mimics the torque curve particularly at the torque peak. As shown here by the shaded areas, it falls off at lower RPM due to poor mixture quality and insufficient inlet airspeed. On the upper end it is limited by insufficient time to fill the cylinder due to increasing RPM. Note that 5,252 is constant throughout these formulas while RPM, horsepower, and torque are the variables. That’s important because 5,252 represents the fixed RPM where torque and horsepower are equal. It is constant. If you’re looking at a dyno sheet, the torque and horsepower numbers should match at 5,252 rpm. And if the dyno curve is presented graphically, the horsepower and torque curves always cross at 5,252 rpm. At that point, torque begins to fall off while horsepower continues to rise. At any point along the graph or chart, you can calculate one value from the other by using the constant 5,252. This one fact makes sure you never get cheated by a fabricated dyno sheet. All engines generate a particular torque signature based on displacement, engine speed, VE, and flow path dynamics.Not surprisingly, all engines are influenced by specific architecture (i.e., I4, I6, V-6, V-8, V-10, V-12, etc. ), each of which applies different attributes to cylinder filling, mean net torque, and overall engine smoothness. 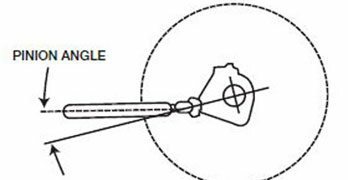 Every combination generates a torque peak or “sweet spot” where its particular tuning dynamics achieve maximum volumetric efficiency. In the case of competition engines, this often exceeds 100 percent VE, sometimes by a considerable margin. The old adage that an engine is an air pump is assuredly true, but we might also think of it as an air processor. Power is governed by the amount of air the engine can process over time and the brake specific fuel consumption (BSFC) generated by the efficiency of the specific component mix. It’s relatively easy to supply enough fuel, but it is considerably more difficult to maximize airflow without the aid of a power adder. For any given collection of parts, an engine achieves a torque peak influenced predominantly by intake and exhaust tuning relative to its size or displacement. Through attentive manipulation of these and contributing component hardware, the torque curve can be shaped and positioned to suit the engine’s final application. This is a principal focus of all competent engine builders and it begins with the pursuit of VE relative to the engine’s static air capacity. The air mass component depends largely on available air density and the VE a specific component mix is capable of generating. 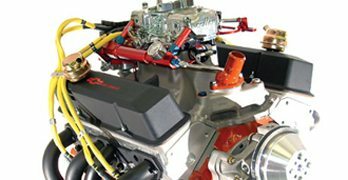 It is primarily governed by inlet and exhaust flow path dynamics, combustion chamber efficiency, valve timing and elements of the bottom end and valvetrain that dictate final RPM capability. 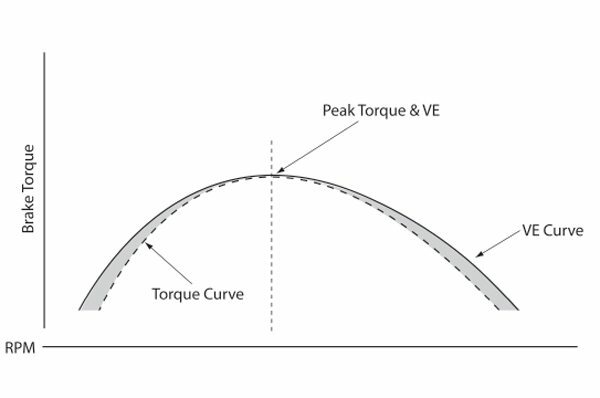 As shown in the illustration on page 50, the shape of the torque curve matches the VE curve at peak torque. This is the point of maximum engine efficiency and it typically reflects the lowest wide-open-throttle (WOT) brake specific fuel consumption numbers. Below the peak torque trails the VE curve due to reduced combustion efficiency caused by inadequate intake flow velocity, air/fuel separation, issues and poor mixture quality. Above the torque peak, torque and VE decline due to insufficient time for cylinder filling caused by rising engine speed (RPM). Fortunately there are methods to address inefficiency on either side of the torque peak and inflate the overall torque curve. This refers to the “area under the curve” and seeks to expand the torque curve in all directions. Horsepower, being a function of torque, follows faithfully. More importantly, a broader torque curve often produces greater acceleration even with a slight reduction in peak torque because it applies more torque over a broader range. If the ideal mix of engine components targets an engine speed range most beneficial to the application, superior performance will accompany it. Complementing these performance gains with appropriately matched gearing and tire combinations ultimately leads to faster cars and better racing all based on the effective production and utilization of torque. 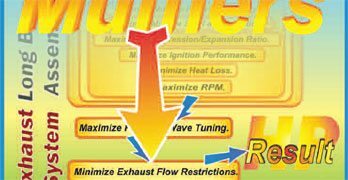 This works well even for engines operating well above the torque peak because the upper end of the torque curve expands, thus contributing more horsepower to the car’s performance. If the power peak is really 5,900 rpm, how much torque is the engine generating at that engine speed? Well above 1 horsepower per cube and still climbing. That’s a convenient way of looking at the torque and horsepower relationship based on a contemporary engine with published numbers. Note that the dyno sheet begins with entries to indicate a test number, a date, time, and operator. Then it asks for a description of the engine being tested and the type of test being performed. There are three basic test modes: steady state at a selected RPM, a sweep test where the engine is accelerated (unloaded) through a selected RPM range at a fixed rate, and a step test where the engine is held at predetermined RPM intervals until a stable reading is taken at each RPM level. Step tests are usually run in 250- or 500-rpm increments through a selected RPM range, say, 2,500 rpm through 6,500 rpm for example. 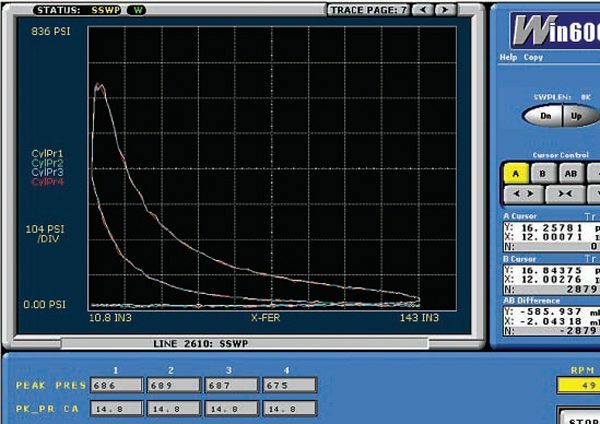 The dyno sheet shown here tells us that the test is a sweep or acceleration test at a rate of 300 rpm per second, starting 2,600 rpm and ending at 6,400 rpm (in fact a controlled unloading of the power absorption unit, not an actual acceleration test). 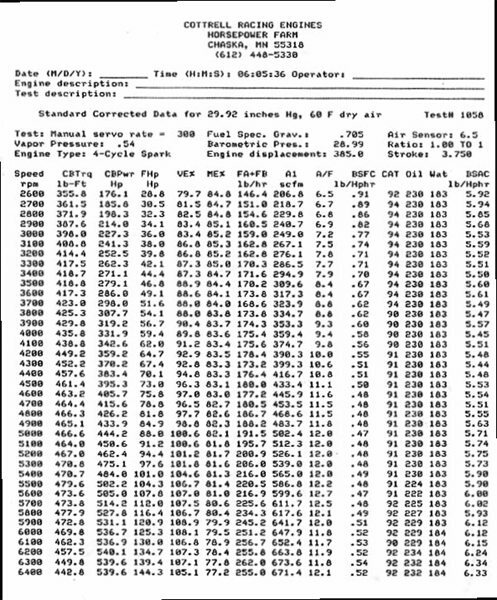 The adjacent dyno printout from Cottrell Racing Engines provides all relevant information for one sweep test. See the text to learn how to evaluate and verify the information found in typical printouts such as this one. 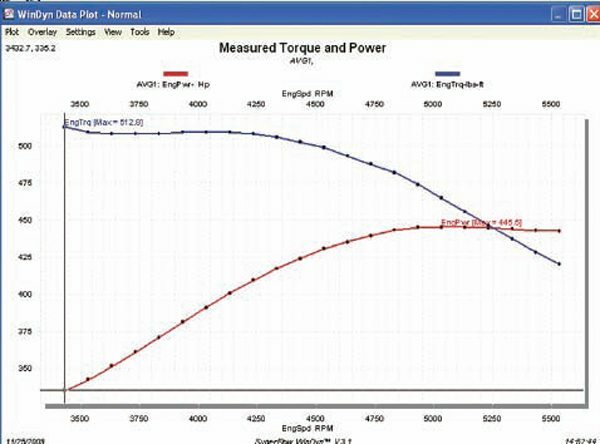 This SuperFlow engine dyno plot illustrates how the torque and horsepower curves cross at 5,252 rpm as described in the text. The test takes about thirteen seconds at that rate. Note that the test also specifies the specific gravity of the fuel, the barometric and vapor pressures, engine displacement, and stroke. These are entered into the computer prior to the test. Take a look at the first three columns: RPM, corrected torque (CBTrq), and corrected power (CBPwr). For any given RPM, you can use a variant of the horsepower formula to verify either the torque or the horsepower to see if they are correct. Let’s try the torque at 4,000 rpm and see if the horsepower computes properly. Now try the horsepower at 5,000 rpm and see if the torque is correct. Right on the money with minor rounding. Now examine what’s going on at the crossover point of 5,252 rpm. At 5,200 rpm we see 467.0 for torque and 462.4 for horsepower. Why aren’t they equal? Because the engine speed component is not exactly 5,252 rpm. Looking at the sheet we might infer that torque at 5,252 rpm is 468.9 ft-lbs by averaging the numbers we see at 5,200 rpm and 5,300 rpm. Note that we selected 5,250 rpm, not 5,252 rpm. It seemed logical to split the difference between 5,200 and 5,300 rpm, but in fact the numbers are still slightly mismatched. If we actually use 5,252 rpm for the calculation, the answer comes out exact. The relationship is balanced based on the constant established by Watt in 1780. Later in the book, we’ll see how you can relate these torque and horsepower numbers to other recorded data for tuning purposes. It’s a good idea to keep dyno numbers in perspective. They are typically referred to as either gross or net figures. Gross power numbers indicate the engine’s performance potential under ideal conditions such as within a dyno cell. 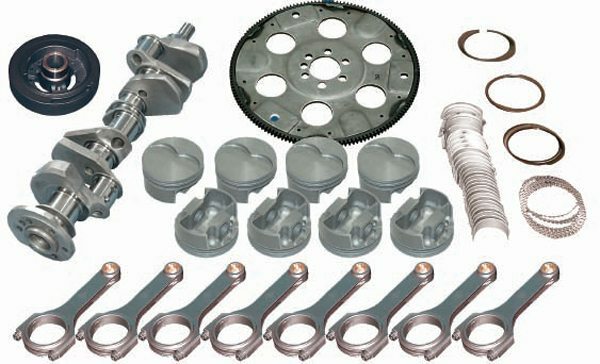 This frequently means headers with no restrictive exhaust system and no parasitic losses from auxiliary components such as a fan, alternator, power steering pump, AC compressor, mechanical fuel pump, and even the water pump in many cases. It is maximum observed power at the flywheel, which is typically corrected to SAE standard J607 or standard temperature and pressure (60-degree dry air and 29.92 Hg barometric pressure). 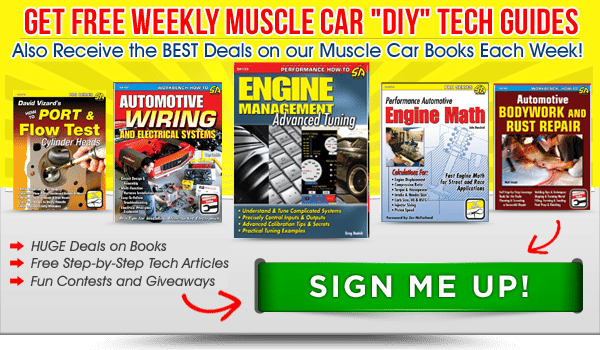 This correction is used by most dyno shops and performance magazine testers. Or it is corrected to SAE standard J1349 (77-degree dry air and 29.93 Hg) as used by OEM automakers. The difference is about 4 percent; so for comparison testing you should always compare numbers based on the same correction factor. Different correction factors can be mathematically converted, but it is always easier to compare apples to apples. Net torque and horsepower represent the real world with all the ugly parasitic components in play, including the air cleaner, a full exhaust system, and all the items required to make a vehicle fully functional. Few of these items are ever in place on an engine dyno, but they are there for a chassis dyno test and the numbers vary accordingly. The chassis dyno also accounts for all the friction and inertia losses in the drivetrain and the tires. We pay closer attention to this today, but in the 1960s and 1970s, they looked at things a little differently. For racing and insurance purposes, the OEMs often underrated brake horsepower (bhp). Typically they published a brake horsepower figure at a specified RPM, but neglected to mention that power kept rising above that point. It was an arbitrary rating, and not necessarily the maximum output. In 1971 General Motors switched to net ratings, although they still published both ratings for just that one year. All of the other automakers followed them shortly. Today we see only net ratings—isn’t it interesting how high they have climbed as automakers improve efficiency? Still, muscle car enthusiasts often long for a way to compare net and gross ratings for their cars. There is no direct conversion factor, but we might infer some educated guesses based on horsepower per cubic inch. One horsepower per cubic inch used to be the magic number. Among others, the fuel-injected 283-ci smallblock Chevy V-8 achieved it back in 1957. Most cars had far less. At 128 gross horsepower, a 263-ci 1952 Buick straight-8 provided 0.48 hp/ci. A 375-hp 396-ci Chevelle offered 0.94 hp/cl in 1966 while the average vehicle was still mired somewhere between 0.5 and 0.8 hp/ci. The 1970–1971 Dodge Challenger R/T had a 390-hp 440 Six- Pack that delivered 0.88 hp/ci. How about the 1969 Z28 Camaro? Its 290-hp 302-ci engine delivered 0.96 hp/ci; a gross rating that we know was better. The engine made more horsepower above the published RPM and the cars were fast for their weight and displacement. Big-valve iron cylinder heads of the day barely flowed 200 cfm, yet Traco Engineering and GM dyno sheets show more than 400 hp from blueprinted Penske Trans Am engines. That’s more than 1.3hp/ci in gross or race trim. Of course these were race-prepped engines, but if we assume 1.1 hp/ci (relatively easy to achieve today) it is easy to see that the production 302 probably made 330 to 350 hp gross, which may have nettled about 275 in the car. An educated guess, but probably still enough to provide the ETs and speed those cars typically ran. One can only speculate. Low-compression base engines suffered miserably. 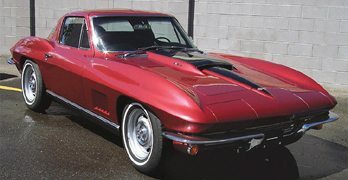 The base 1971 Chevy 350 was rated at 245 gross hp, but only 165 net hp. That’s 0.47 hp/ci, which is worse than the 1952 Buick straight-8. Go figure. It serves to illustrate how much engines are affected by lower compression ratios, unfavorable fuel and spark curves and excessive parasitic losses in the engine and in the driveline. 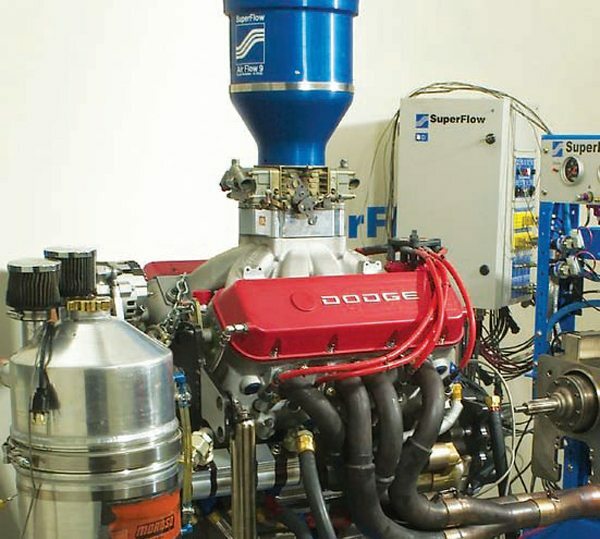 While the engine dyno is an effective tool for measuring an engine’s output, it can’t directly measure losses within the cylinders due to the friction and inertia of the operating parts. It only measures output at the flywheel, not what is left on the table due to physics. We know that the engine makes torque when combustion pressure forces the piston down and turns the crankshaft. The force applied to the piston top is simply the combustion pressure (cylinder pressure) times the area of the piston top. Since gasoline engines operate on the expansion cycle, cylinder pressure varies greatly during a power stroke. It is greatest just after ignition and falls off quickly as the energy is transferred to the piston to turn the crankshaft. 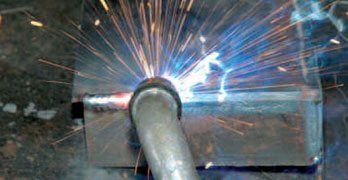 Spark advance gives the combustion process a head start before the piston reaches TDC, but peak cylinder pressure generally occurs about 12 to 15 degrees after TDC when the piston is just starting to travel down the bore. 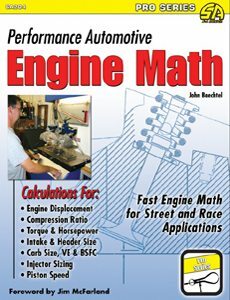 If we know the cylinder pressure we can calculate the indicated horsepower using a widely accepted formula called PLAN. On closer inspection we find the displacement formula in the middle of our equation. If we already know the displacement we can substitute it to simplify the equation. 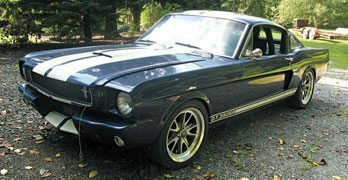 • If you shorten the stoke to increase RPM, you increase N, which gives you more power strokes per minute. • If you overbore the engine, you increase A for more piston area to be acted upon by cylinder pressure. • If you raise the compression ratio, you increase cylinder pressure (P). Because MEP only occurs within the cylinder, it is difficult to measure directly. 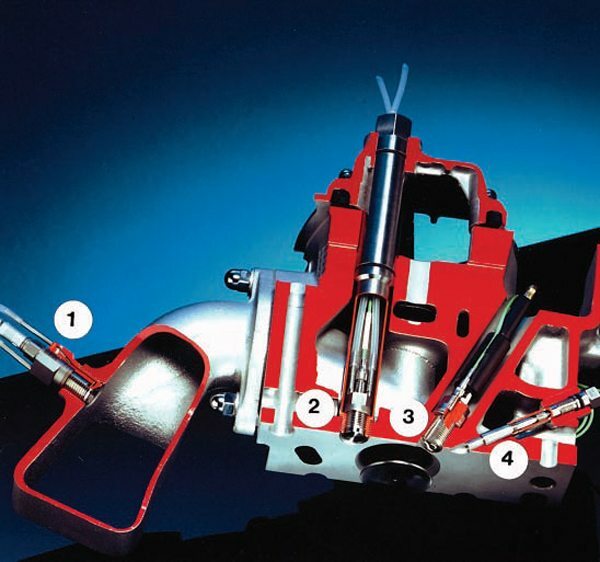 Engine labs like Hi-Techniques insert a small pressure transducer directly into the combustion chamber to measure the mean effective pressure of an engine running on the dyno. (SuperFlow Technologies calls this Engine Cycle Analysis.) 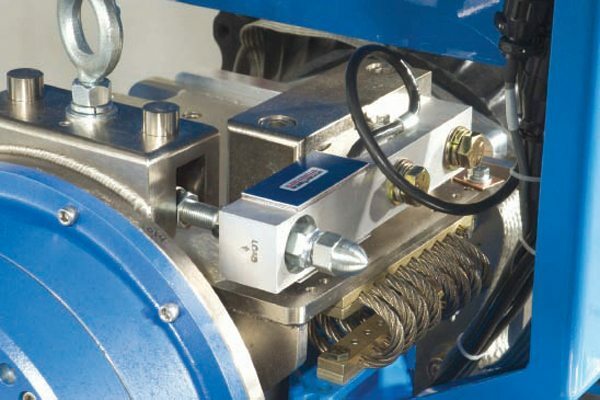 A rotary crankshaft encoder is teamed with the pressure transducer to pinpoint mean effective pressure at every degree of crankshaft rotation. The pressure transducer is called an “indicator”; hence, the term Indicated Mean Effective Pressure (IMEP). This mean effective pressure measured on the dyno is the pressure (P) used in the PLAN formula. The operative word here is “mean.” The pressures we are discussing are mean or “average” pressures that occur over the duration of the power stroke. This makes them sound too low, but cylinder pressure varies greatly throughout the power cycle. Just after ignition, the pressure in a high-performance engine may exceed 1,200 psi, but it decays rapidly during the expansion process as it pushes the piston down the bore. If you have a 4.125-inch piston with 13.36 square inches of piston area, that 1,200 psi very briefly becomes more than 16,000 pounds of force pushing on the piston. 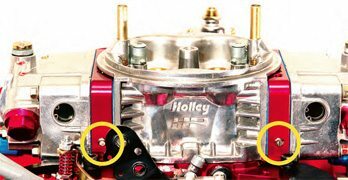 Midway down the bore, the pressure may be less than half the initial pressure and it drops off to near atmospheric when the exhaust valve cracks open. 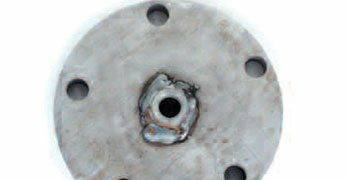 Keep in mind that IMEP is an average pressure derived from very high pressure at the ignition point and there is rapid decay from there on down the bore. This average pressure times the leverage of the stroke length and many repetitions (rpm) yield average torque and, thus, the average horsepower that makes your car go fast. Dyno operators tell you that peak MEP occurs at the same RPM as peak torque. That’s the point of maximum efficiency, but we can calculate the indicated torque at any RPM provided that we know the IMEP at that point. To calculate indicated torque, multiply the MEP times the exact calculated displacement and divide by 150.8. Revisiting our 360 Dodge engine once again, we simply plug in the variables. The 150.8 is a constant. Now recall that horsepower equals torque times RPM divided by 5,252 and see what you get. The same answer we get from the MEP calculation. Suppose you have an engine making 500 hp at 6,800 rpm. If the displacement is 383 ci, what is the MEP? We know from the torque formula that the same 383 makes 386.17 ft-lbs of torque at the same RPM. So we can also calculate the MEP from torque using that figure. 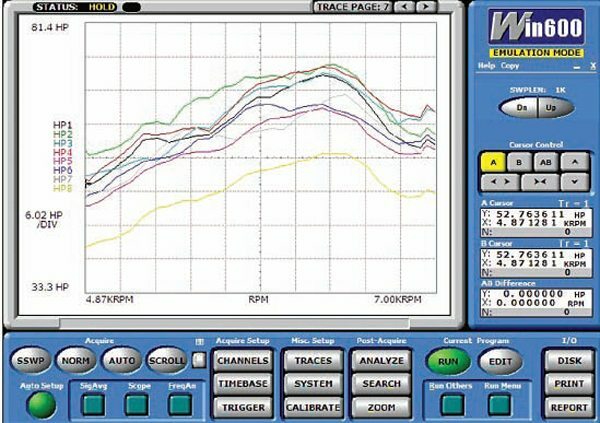 One of the results of precision in-cylinder pressure measurement is this output graph from Hi-Techniques Win600e analysis software. The graph displays the horsepower output of eight individual cylinders from 4,870 rpm to 7000 rpm. Of particular note is the yellow trace (bottom), indicating that cylinder number-8 is not participating equally in the power process. To review briefly, the Indicated Mean Effective Pressure (IMEP) is the force acting against the piston top. It is a measured number. Friction Mean Effective Pressure (FMEP) represents the frictional losses between the pistons and cylinders walls and the crankshaft bearings. The difference is the actual output at the flywheel. It is calculated from observed torque on the dyno. It can also be calculated from observed horsepower which is derived from torque. Combustion pressure times piston area and the leverage imparted to the crankshaft makes our cars go fast. Dyno operators always tune for max torque because horsepower is a function of torque. You might say that torque is the force that gets a car moving and horsepower is what keeps it accelerating. That’s pretty close to correct, but the real key to maximum performance is the area under the horsepower curve. The car with the greatest average horsepower across its entire RPM range will be the faster car even if its opponent has higher peak numbers. The modifications we make are all aimed at increasing the mean effective pressure on the piston. MEPs range from 170 to 185 in most high-performance applications and most racing engines operate at slightly above 200 psi. An engine’s mechanical efficiency (ME) is its ability to overcome the frictional losses generated by its moving parts. The question is often asked; why does an engine idle? Well, because at minimum throttle angle it makes just enough torque to overcome its frictional and pumping losses. If we’re lucky enough to have both brake and indicated output figures, we can calculate an engine’s mechanical efficiency using the following formula. Assume an engine that has 488 indicated horsepower at 5,900 rpm and 460 ft-lbs of torque at 4,600 rpm. Its measured brake output is 426 hp at 5,900 rpm and 420 ft-lbs of torque at 4,600 rpm. 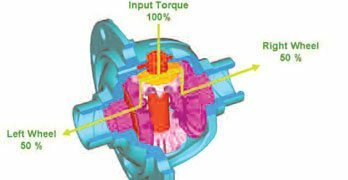 Calculate its mechanical efficiency from horsepower and then from torque. ME = (426 ÷ 488) x 100 = 87.29% ME = (420 ÷ 460) x 100 = 91.30% The difference in mechanical efficiency represents the friction losses within the engine. In this case friction withholds 62 hp and 40 ft-lbs of torque. Note the higher efficiency at peak torque. The engine achieves its best volumetric efficiency at that point and is better able to overcome its parasitic losses. So why does this matter? Do you suppose those numbers bear a strong resemblance to our 2010 Camaro SS brake output figures? If they do, it means the Camaro engine really has the potential to make 1.3 hp/ci in street trim. You have to have more potential than what the brake shows you in order to overcome frictional losses. Are these numbers a guess? Sure they are, but think about it. Who is better at finding engine efficiency than the OEM automakers? They want all the power and efficiency they can get so they do everything possible to reduce friction and pumping losses. Racers do the same thing. They use thinner piston rings, narrower bearings, piston and bearing coatings and a whole bag of tricks to increasing MEP So is the Camaro engine really a tamed down racing engine? If you thought that, you might be close to correct. Say you’re trying to break an existing speed record at Bonneville. You’ve already got drag and frontal area numbers for your car and you have calculated that you need 800 hp to get the job done. Further assume that you are class limited to 372 ci. Of course, traction, aerodynamics, and weather will influence your efforts, but 800 hp seems capable of producing the desired result. Well, that’s 2.15 hp/ci, which is right up there with some of the best normally aspirated engines. If you run 14:1 or more compression ratio with good cylinder heads and camshaft timing, you should be able to generate an MEP of 200 psi and maybe even 210 psi. Conservatively assuming that you achieve an MEP of 200 psi, what RPM will produce the desired horsepower given your stated displacement limit? That’s not going to cut it. You’re going to have to spin the engine a good bit faster or modify your package to raise the MEP. Let’s try more RPM first since it might be easier to achieve. Plug in 8,000 rpm and you only reach 752 hp, so you still need more engine speed. Try 8,500 rpm. Now that certainly seems possible. 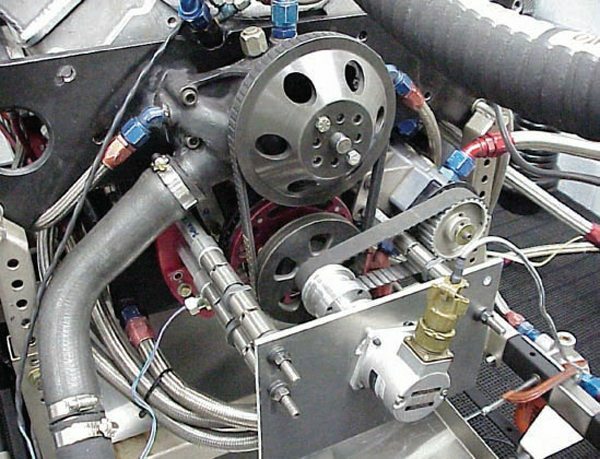 If you’ve built a big-bore small-block with a relatively short stroke it will probably handle up to 8,500 rpm without distress on the dragstrip or even Bonneville’s 5-mile dyno. So the answer is a definitive yes. You can get there within achievable RPM limits if you concentrate on building maximum MEP. That means higher compression, cylinder heads with superior breathing, a light, stable ring package for optimum cylinder sealing, and all possible efforts to minimize parasitic losses in the short block. All things that we strive for in a competition engine. You can see how the horsepower formula can help you predict engine performance based on projected mean effective pressure. There’s more to it of course, but if you sweat the details and generate the required MEP within your displacement and RPM limits, you’re well on your way to making big power.